'Matthew Henson at the Top of the World' by American author Jim Haskins is a short biography. The story is about a black American who was among the first people who successfully reached the North Pole and whose deed was undeservedly forgotten. The author told about the difficult childhood of Matthew Henson. He grew up without his parents, he needed to work hard to survive. Since a young age, he served on the small ships, he sailed to different parts of the world. After years of traveling, he got a job as a clerk in a clothing store. 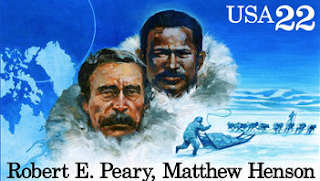 During that time he met with Robert E. Peary - at that time a young navy officer of the USA - the future pioneer of the way to the North Pole. Pearly offered Matthew a job. Since that time they had several geographical expeditions together. The walking part of their journey started the 1st of March, 1909. As the expedition went on, Pearly had to send back several men due to their exhaustion and frostbite. Despite the temperature was sub-zero, the expedition encountered troubles with open water. One traveler went ahead and didn't come back. Only his coat was found floating in a hole in the ice. Finally, they reached the North Pole. This was not only their success, it was is a great achievement of all humans. But his deed wasn’t rewarded. The National Geographic Society gave the gold medal only Peary, Matthew’s contributions to the expedition were not recognized for many years.